Before we get started, we have some big news! We’ve opened applications for HackSussex! The only requirements are that you’re currently a student and are 18+, no prior tech/coding experience required! The application only takes a minute, so why not fill one out now? Tickets are free and meals will be provided free-of-cost. The event will take place on the 11th & 12th November. Fresher’s fair is a day in Freshers week where all the students, new & returning, get to roam around and signup to societies! At Sussex we all had tables outside, dotted along the path of the main entrance. Unfortunately on the day it rained throughout, so we didn’t quite get the turn out that we had hoped for… and we all got soaked. But we made the most of it! We are going to be running workshops leading up to the hackathon covering basic web dev, app development,etc. You don’t have to be a programmer/engineer to attend. It’s open to everyone. Our event is 100% beginner friendly. By the end of the day we had taken down roughly 40 new students email address and handed out all of our 200 leaflets! The biggest thing we all took away from the fair was that there were many people who wanted to code but thought it wasn’t for them. We’re looking forward to proving them wrong! There were also quite a few people actively looking for a society that would teach them to code. This re-enforces our belief that we need to be reaching out beyond traditional hacker subject areas and ensuring that our workshops & hackathon reach everyone, whether they are studying humanities, sport, art, etc. 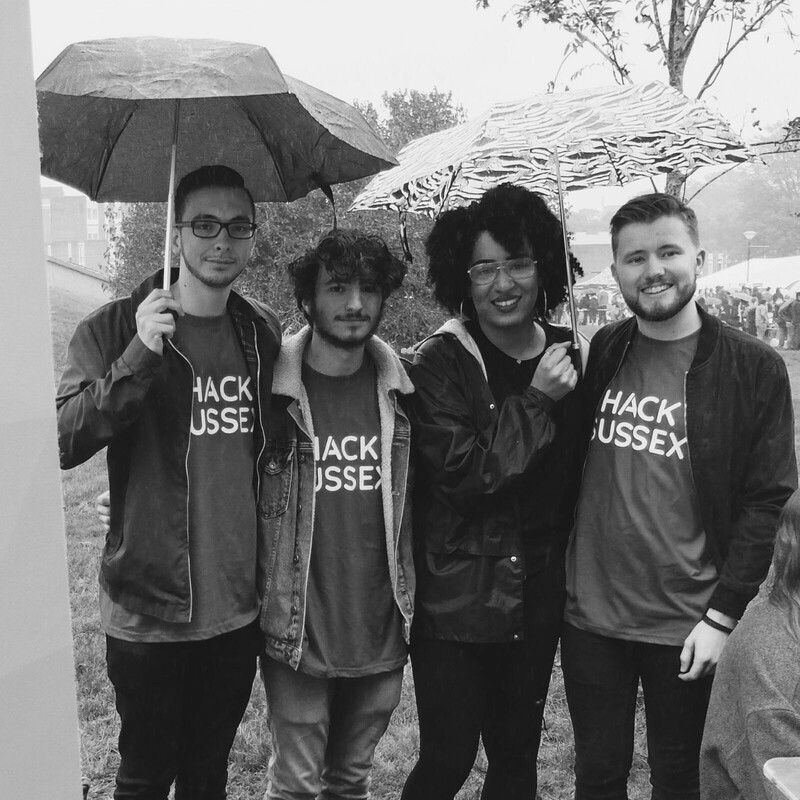 Besides the Fresher’s fair, a group of HackSussex members travelled up to Birmingham for HackTheMidlands! It was a great event and really got us in the mood for the rest of the season and sparked some ideas for our own event! Big thanks to everyone at the event, we had a wonderful time (unfortunately I don’t think we can say the same for the inflatable unicorn 💔). We’ve finished designing our full website and I’m now in the process of developing it. You can expect this to be live within the coming weeks. It will contain a whole load more detail on our hackathon, including the schedule, sponsors and challenges!